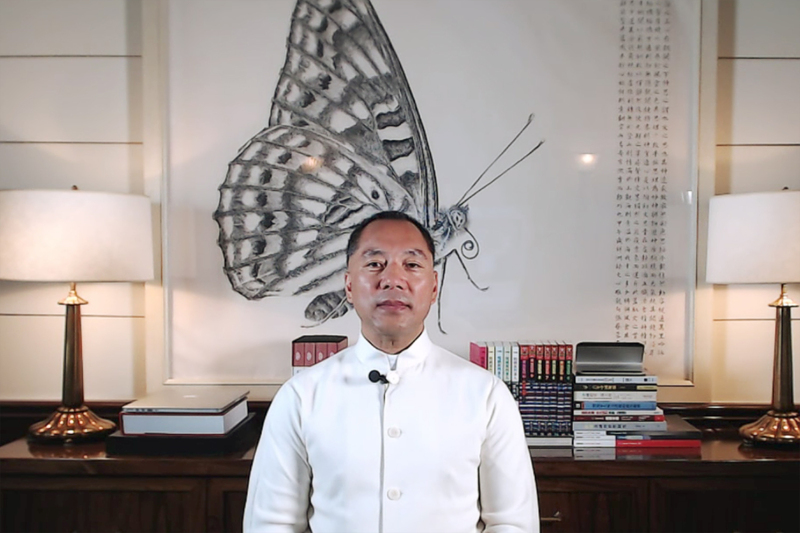 Guo Wengui, in still from a live-streamed video on his YouTube channel, July 9, 2017. The life and times of Chinese billionaire Guo Wengui reads much like an epic play, so it is fitting that we have included with this podcast a dramatis personæ to explain the many characters in Guo’s story. Scroll to the bottom, below the recommendations, to follow along with them in order of appearance. New York Times journalists Mike Forsythe and Alexandra Stevenson have spent over a dozen hours with the turbulent tycoon at the New York City penthouse overlooking Central Park where he resides in exile, listening to his stories and carefully investigating his most scandalous claims. Forsythe has for years been a leading reporter on the intersection of money and power in elite Chinese politics, first at Bloomberg and then at the Times. Stevenson, as a reporter at The Financial Times and now The New York Times, has focused on covering hedge funds, emerging markets, and the world of finance. Are Guo’s myriad corruption allegations, which go as high as China’s anti-corruption chief, Wang Qishan, credible? Is even Guo’s own life history verifiable? Who is he really, and why is he on this quest to unveil the shadowy world of Chinese elite politics? Mike and Alex don’t have all the answers, but they are two of the best people in the world to shed light on what is profound and what is puffery in Guo’s version of events. Yue Qingzhi 岳庆芝, Guo Wengui’s wife, lives in New York, according to Guo. Yet she has not been seen in public nor by Forsythe and Stevenson, even though they have spent entire days at Guo’s penthouse. Wang Qishan 王岐山, the leader of Xi Jinping’s anti-corruption campaign, secretary of the Central Commission for Discipline Inspection (CCDI). Li Keqiang 李克强, the current premier of China’s State Council, formerly a Party secretary in Henan Province where Guo claims to have met him. Wu Yi 吴仪 served in top ministerial positions negotiating trade and managing public health in the early 21st century. Guo claims to have developed a relationship with her back in Henan. Wu Guanzheng 吴官正 served as secretary for CCDI from 2002 to 2007. Ma Jian 马建, the now-jailed close associate of Guo who served as vice minister of State Security from 2006 to 2015. Liu Zhihua 刘志华, the former vice mayor of Beijing who was dismissed in 2006. Liu received a suspended death sentence for taking bribes of over 6 million yuan (U.S.$885,000) in October 2008. He Guoqiang 贺国强, the predecessor to Wang Qishan as secretary of the CCDI. Guo alleges that his son He Jintao 贺锦涛 had a financial stake in Founder Securities at the time Guo tried to muscle his way into the company (the Times has confirmed this). HNA Group, formerly Hainan Airlines, a politically connected business conglomerate that burst onto the public scene in 2016, scooping up foreign companies left and right. Hu Shuli 胡舒立, the editor-in-chief of business news and investigative outlet Caixin (disclosure: Caixin partners with SupChina on the Business Brief podcast). Li You 李友, Guo’s former business partner. In 2016, he was sentenced to four and a half years in prison and fined 750 million yuan (U.S.$110 million) for insider trading. Yao Mingshan 姚明珊, the wife of Wang Qishan. Meng Jianzhu 孟建柱, the current secretary of the Central Political and Legal Affairs Commission, which controls the police and security services. Xiao Jianhua 肖建华, another billionaire tycoon who had experience dealing at the top levels of the Chinese government. Xiao was apparently abducted by Chinese authorities in Hong Kong in late January 2017 and has not been seen in public since then. Zhang Yue 张越, a former provincial Party secretary in Hebei Province. Meng Huiqing 孟会青, a now-jailed former CCDI official. Fu Zhenghua 傅政华, the deputy minister of Public Security. Yao Qing 姚庆, grandson of revolutionary and former vice premier Yao Yilin 姚依林, and nephew-in-law of Wang Qishan. Guo’s two children, his son, Mileson Kwok 郭强 (Guo’s English name is Miles! ), and his daughter, Guo Mei 郭美, whom Guo claims went to New York University with Ma Jian’s daughter. A “dissident-minder from Guobao” (Ministry of Public Security 国保), identified later in the podcast as Sun Lijun 孙立军, one of two people Guo claims to have met with in Washington, D.C., in late May 2017. Amanda Bennett, the director of Voice of America (VOA), which aired an interview with Guo on April 19 that Guo and some VOA journalists complained was cut short.